The series revolves around Inspector Shunpei Kusanagi and his friend, Manabu Yukawa, a physics professor who, occasionally, helps Kusanagi solve some of his most challenging cases, and is known as the Galileo detective. This story starts with the death of a wealthy business man, Yoshitaka Mashiba, by arsenic poisoning. There is one prime suspect – Yoshitaka’s wife Ayane, but she has an iron clad alibi. Working on the case are detective Kusanagi and his assistant Kaoru Utsumi, with some help from Prof. Yukawa. Salvation of a Saint is what I call as “minimalist suspense thriller”. There is only one suspect, that too with a perfect alibi, very few characters, very few (and very subtle) clues. It is very clear, within the first few pages, who committed the murder and why. And it takes the rest of the book to figure out how!! It is really commendable that the author has managed to keep interest levels high and the narrative simulating enough to keep reading. By the time I was half-way thru, the only thing I wanted to know was how it was done. The book was simply un-put-down-able. After the ‘The devotion of suspect X’, I had very high expectations from this book and it certainly lives up to it. A very intelligent book, indeed. For fans of mystery genre, both this and The Devotion of Suspect X is a must read. 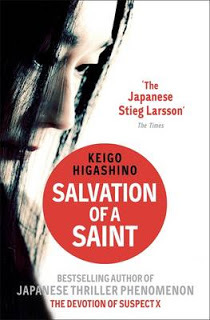 PS: In some marketing/PR stuff, Higashino is referred to as “The Japanese Stieg Larsson. This is a very unfair comparison (both to Higashino as well as to Larsson). There is very little in common between the their writings, apart from the fact that both belong to the broader genre of thrillers and were translated to English. PS: Keigo Higashino’s next novel ‘Journey Under the Midnight Sun’ is releasing on October 08, 2015 and I am already excited about it.